NEWTON, MASSACHUSETTS (USA) – Point files with the locations for some of the largest U.S., Australia, Canada, and United Kingdom businesses are now downloadable for free for Maptitude 2018. The download includes point layers for automotive, bank, cellular phone, convenience store, gas/petrol, grocery, hotel, pharmacy, restaurant, and retail chains. These business layers are available for Australia (688 layers), Canada (538 layers), the United Kingdom (754 layers), and the United States (1824 layers). These business location layers are perfect for site location, competitive analysis, routing, and real estate reports. 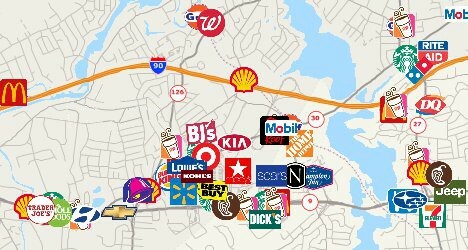 The layers can be added to any Maptitude 2018 map, and most have company logos. Maptitude includes a vast amount of business critical data at no additional cost, such as demographics, boundaries, streets, and the most accurate ZIP Code/postal boundaries available. If you have any questions about Maptitude or data availability contact Caliper.